An international festival of student made films from Friends Schools and Meetings worldwide that is dedicated to making films that depict Quaker values in action! The Bridge Film Festival provides a forum for dialog, learning, and exchange of ideas of commonality and diversity. Serving student filmmakers across an international network of Quaker educational institutions, the festival is committed to nurturing purposeful filmmaking that communicates messages of conscience. Guided by the Quaker principles of truth, community, equality and peace, the festival gives voice to student expression and recognizes creative achievement. 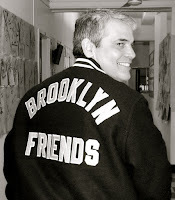 In 2000 I returned from summer vacation to begin my second year as a film and video teacher at Brooklyn Friends School with a simple idea to create a film festival that encouraged students to produce work containing messages of concern. Combining that idea with the ready-made Quaker pedagogical philosophy and network of schools under the umbrella of the Friends Council on Education, I recognized a unique opportunity to reach out to student filmmakers on an international scale. This festival would have the added benefit of strengthening bonds among Friends schools around the world. Imagine that. With the continuing support of Brooklyn Friends School, the Friends Council on Education and the students, parents and faculty of participating schools and Meetings the simple idea sustains. A Brooklyn Friends School Entity. Simple theme. Theme images by rami_ba. Powered by Blogger.